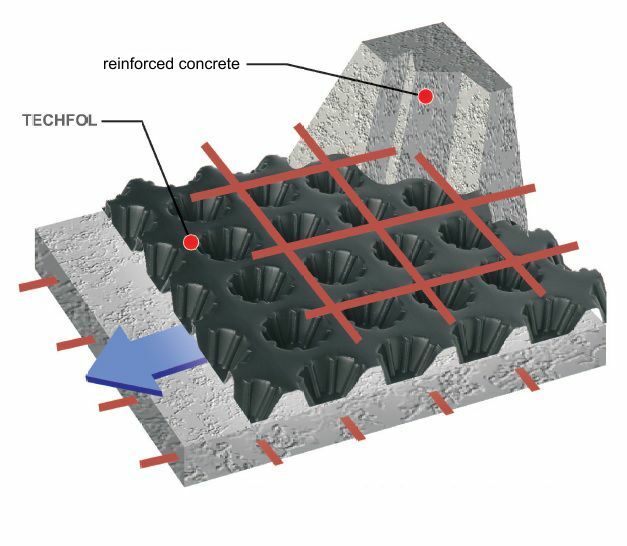 extruded foil HDPE with perforation 20 mm to the so-called " Green roofs "
TECHFOL a series of dimpled membranes designed for special structures of floors and walls, when they are designed as drainage structures (diaphragm walls and foundation slabs) to eliminate destructive hydrostatic pressure that is caused by a deep foundation of a construction object, for example, multilevel garages, and structures with high ground water table or rainwater level. The protection lies in the fact that the geomembrane laid, or rather its profiles (dimples) become a “mould” filled with concrete, thereby forming (after curing) a drainage structure. 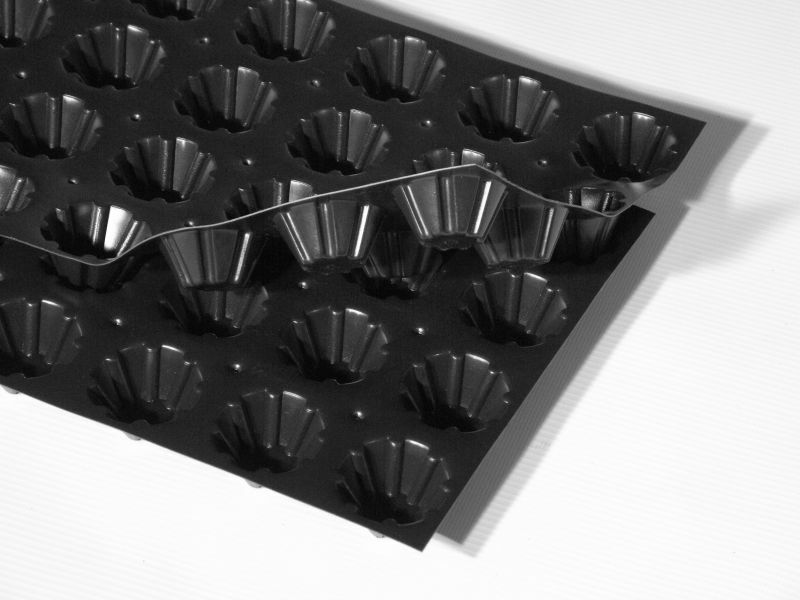 A special “ribbed” design of dimples ensures their resistance to pressure when filling the structure with concrete. The resulting 20 mm air gap is also a draining space providing a water flow in an amount of more than 12 l/ms. This type of waterproofing structures do not even require separation geotextiles, because this function is performed by, for example, a diaphragm wall. 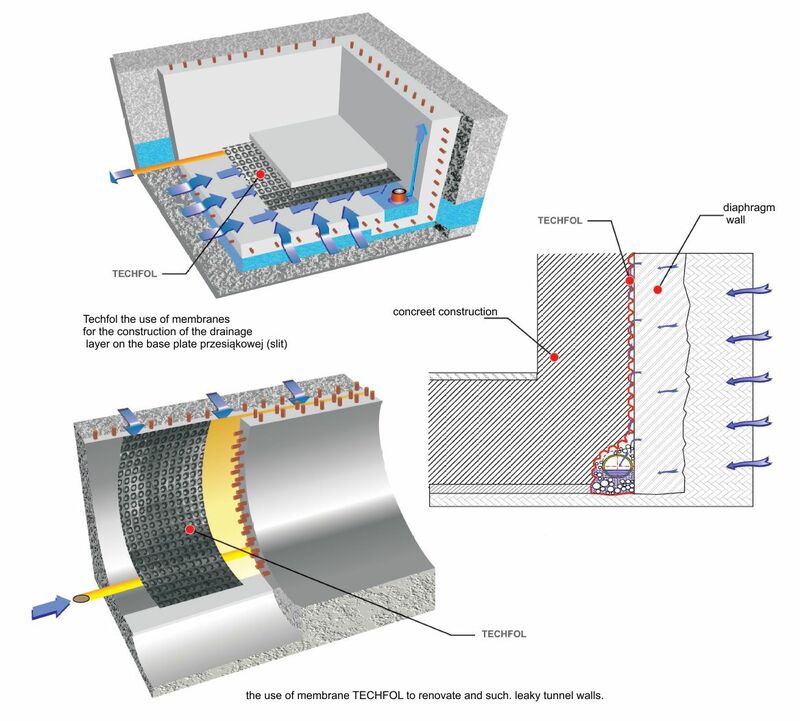 TECHFOL dimpled geomembranes were also developed with a view to their use as waterproofing structure element in the process of repairing damaged walls and vaults of tunnels. TECHFOL geomembrane is supplied in rolls. Its installation is done by proper laying on the protected surface. The membrane shall be overlapped. Each of joined sheets shall overlap by a minimum of one row of dimples. The installation process must be scheduled in such a way as to reduce membrane cutting, to avoid damage to the dimples. The membrane can be laid along as well as across the covered surface without losing its hydraulic and mechanical properties. When the design specifies to obtain a tight seal joint of sheets, the overlap shall be performed in such a way that a minimum of three rows of dimples of each of joined sheets shall overlap and a minimum one path of butyl tape is placed within the overlap area. Before laying the membrane, previously completed construction works have to be accepted. When using our geomembranes, always follow the installation guidelines contained in the work technical design. TECHFOL geomembrane is supplied in rolls of the width of up to 3 m, rolls are secured and labelled, and CE marked. During transport and storage, the product should be protected from mechanical damages and high temperatures. For longer storage periods, membrane rolls shall be stored upright and protected against sunlight. We are a solid company that cares about the needs of our customers, offering professional service as well as attractive prices.